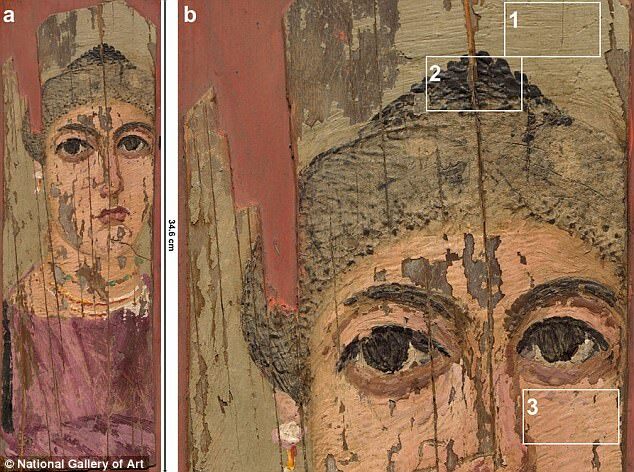 The details of a mummified Egyptian woman's 1,800-year-old portrait have been mapped by scientists in incredible detail. 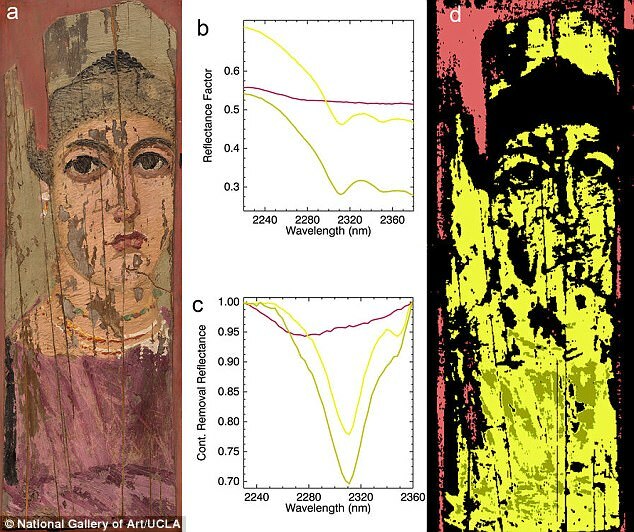 A new non-invasive technique allowed experts to take intricate scans of the second century portrait, revealing the materials and methods the artist used. The images show that the ancient painter used beeswax as a base and plant dyes for colour during his work. A number of different tools helped him to craft the noblewoman's likeness, including a fine painter's brush, a metal spoon and an engraver, the scans reveal. Scientists at the University of California, Los Angeles, carried out the new scans of the painting, which hangs in the US National Gallery of Art in Washington, D.C. 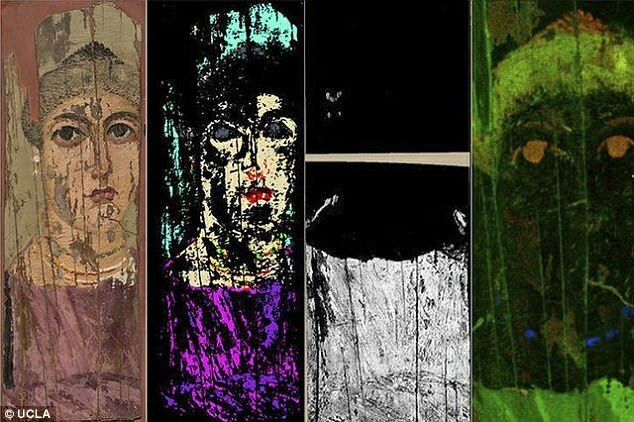 The 35cm by 12cm (14x5-inch) artwork is a 'Fayum' mummy portrait - a painting on a wooden board attached to a mummy that likely depicts the deceased person. It is believed she was once part of a noble family due to her hairstyle, jewellery and red tunic depicted in the portrait. Scans using three different advanced imaging techniques revealed the chemical composition of the paint and the medium used to bind it. Scientists discovered that the painting was made using encaustic - a technique that uses a mixture of pigment and melted beeswax that is 'burned in' on a wooden base. A fine painter's brush, or penicillus; a metal spoon or hollowed spatula known as a cauterium; and an engraver, known as a cestrum, were used to craft the painting. The research, published in the journal Scientific Reports, also offered insights into fashions and artistic methods popular at the time. Scientists discovered that the painting was made using encaustic — a technique that uses a mixture of pigment and melted beeswax that is 'burned in' on a wooden base. 'The decoration of her garment is an excellent example of craftsmanship in real life being reflected within the painting,' said study coauthor Roxanne Radpour. The new mapping method used by the team integrated three techniques - hyperspectral diffuse reflectance, luminescence and X-ray fluorescence. By combining data from all three, experts mapped the chemical signatures of molecules across the surface of the painting for each pixel of the image. 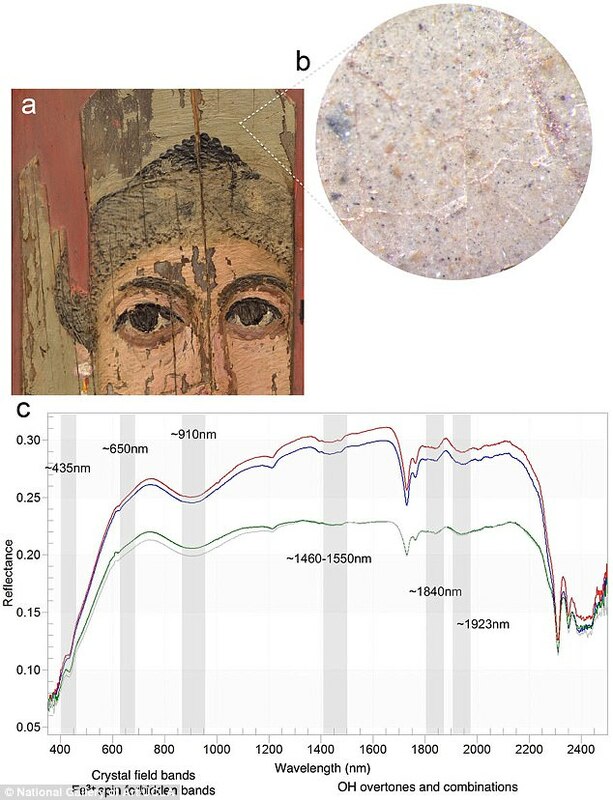 'Without even taking a minute sample from the painting, we mapped out detailed information that tells us exactly what materials were used, and how they were prepared,' said study lead author Professor Ioanna Kakoulli. Study coauthor Dr John Delaney said the project’s goal was to examine how useful the new imaging methods would be for studying archeological objects. 'We had originally developed the three imaging modalities to examine fine art paintings and works on paper,' he said. 'The results, when interpreted by experts of artist material from this time period, show a complete picture of how the object fabricated emerges.